Having your garage door undergo routine maintenance is just like taking your car to the shop every once in a while. You want to make sure everything is working correctly, and that you and you're family members aren't unknowingly walking the tightrope of danger. After all, just like your car, your garage door is a complex electro-mechanical device that could potentially be extremely dangerous when mishandled or neglected. Let's touch on this first, as it is the most important benefit professional maintenance will grant you. Safety, plain and simple, should be at the foremost of any homeowner's thoughts. By getting professional technicians to regularly inspect your garage door for hidden issues, apply the necessary lubrication and replace any malfunctioning component on the spot, you are effectively ensuring that your system stays safe to use. Regular maintenance will prevent many accidents from occurring, as they will be caught well in advance and will be dealt with accordingly. Safety comes first, but security isn't far behind. If your gate isn't routinely maintained by professional technicians, it could develop certain faults and malfunctions that won't become obvious until it's too late. Some of these issues may not pose an immediate safety risk, but they will compromise your home's security. Any would-be thieves could potentially utilize a flaw in your system. By neglecting to take care of them you'll be making a burglar's life easy. As a homeowner, that's the last thing you want. By making sure your garage door is routinely examined and cared for, you'll prevent these types of security weaknesses from being exploited. 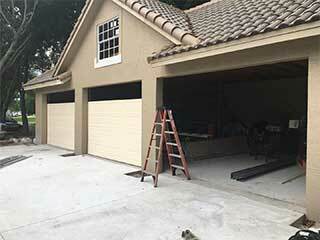 While it is only the third most beneficial reason to get professional garage door maintenance, it is definitely a worthwhile one. Making sure your system stays optimized can actually save you money. If professional technicians routinely examine your system and replace any damaged component before it breaks or malfunctions, the overall longevity of your garage door will be increased. When a spring breaks, for example, other parts of your system get damaged in the process, and therefore by making sure this type of problem – as well as many others – are "nipped in the bud", you'll be allowing your door to keep working smoothly and efficiently for as long as it possibly can. Call our experts at Garage Door Repair Boynton Beach today to schedule a maintenance appointment.